Millions of people are bothered by spider veins – those small yet unsightly clusters of red, blue or purple veins that most commonly appear on the thighs, calves and ankles. In fact, it’s estimated that at least half of the adult female population has this common cosmetic problem. Spider veins can affect both men and women. The gold standard for treatment of spider veins is called sclerotherapy. In this rather simple procedure, veins are injected with a FDA approved sclerosing solution, sodium tetradechol, which causes them to collapse and fade from view. This treatment often helps with other symptoms associated with spider veins, which include aching, burning, swelling and night cramps. A number of factors contribute to the development of spider veins, including heredity, pregnancy and other events that cause hormonal shifts, weight gain, occupations or activities that require prolonged sitting or standing, and the use of certain medications. 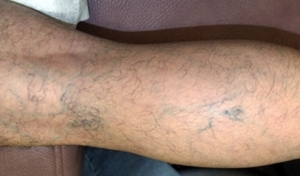 Varicose veins differ from spider veins in a number of ways. 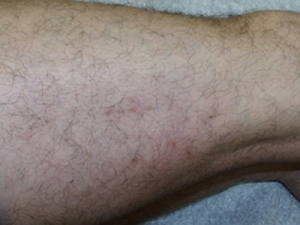 Varicose veins are larger – usually more than a quarter-inch in diameter, darker in color and tend to bulge. 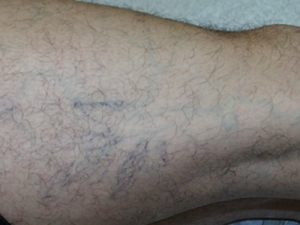 Varicose veins are also more likely to cause pain and be related to more serious vein disorders. Sclerotherapy can enhance your appearance and your self confidence. Most patients are pleased with the difference sclerotherapy makes. The skin of your legs will appear younger, clearer and more healthy-looking. If you’ve been wearing long skirts and pants to hide your spider veins, you’ll now be able to wear shorts again!! Often, patients are surprised at the dramatic difference in appearance between a treated leg and an untreated one. To find out more information about our spider vein treatments, please call us today.